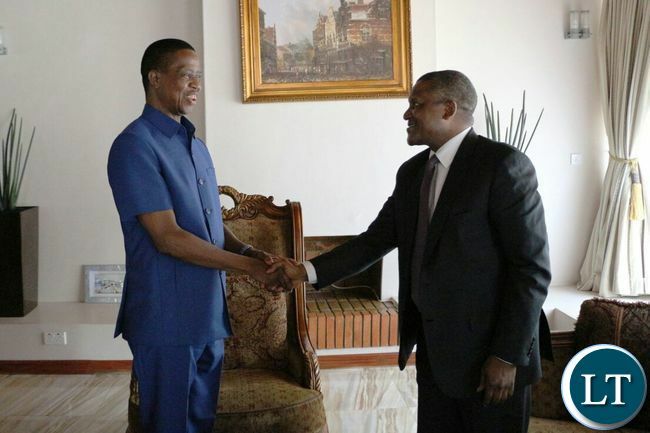 Nigerian multi-billionaire Aliko Dangote who was in Zambia for a one-day visit, Saturday afternoon paid a courtesy call on President Edgar Lungu to express his gratitude for the enabling environment that the country continues to offer investors at every level. During the courtesy call, Mr. Dangote expressed interest to consolidate his existing investments in Zambia and explore opportunities in the energy and agriculture sectors. “I am here not only to explore investment opportunities and consolidate our existing business relations, but also to congratulate your Excellency for your victory in the last general elections. I wish you many years of success as you guide your nation to greater heights and prosperity,” said Mr. Dangote to President Lungu. “We are going to explore investment opportunities in the energy sector and perhaps look at the viability of existing petroleum refinery facilities,” pledged Mr. Dangote. And President Lungu has instructed the Minister of Finance and all relevant government ministries and agencies to ensure that the process of facilitating investments in job-creation enterprises is efficient. Earlier, Mr. Dangote held a consultative meeting with the Minister of Finance Felix Mutati. During the meeting, Mr. Dangote encouraged the Zambian government to strengthen business management skills especially among small and medium enterprises. The Nigerian multi-billionaire also said support by the banking sector to small and medium enterprises is key to deepening the Zambian economy and creating jobs for locals. Mr. Dangote has since left for Nigeria. Government has been caught up in it’s own lies that the current rates being charged by ZESCO are not cost reflective and hence they want to increase the tariffs. You see, if it wasn’t cost reflective then Dangote wouldn’t have shown willingness to invest in the energy sector. From the mini electricity plant that powers his cement business he’s seen that at the current rates being charged by ZESCO, he’s making a huge profit when he sells excess power to them. It is all lies that the current rates being charged by ZESCO are not cost reflective, the government like they always overcharge us taxes want to overcharge us electricity otherwise Dangote wouldn’t want to invest in the energy sector. To take advantage of the demand for maize in the region, the government could have constituted a task force to maximize the use of ZNS and prisoners in the cultivation of maize for feeding the nation whilst allowing the private sector to export maize so that the country earns forex. From the picture, Dangote looked more in control than Lungu. its a lesson to our own business people that you do not have to be a politician to be respected. Dangote is worthy more than Zambia’s GDP, essentially making him more important than Zambia. Nigeria will come for this their money, just like Malawi. Someone talks are agriculture and the first thing that comes to mind is maize and nshima of all things…surely the world does not revolve around maize; there are far more profitable agric products that are far much cheaper to grow and transport than your maize. @1.1 If Zesco was in private hands, there was going a lot of cost saving, such no soccer sponsorship, few managers and all the unnecessary fringe benefits. Above high efficiency. He just came to collect his money back, The money he had put into the PF campaigns, Why should an investor visit the minister of finance i thought he is suppose to go to commerce and industry, anyway Zambians do not think beyond their noses anything goes. Why doesn’t the government take advantage of Congo and produce more mealie meal and export to Congo since Congo has a lot of cash let’s feed that country and earn the most needed forex. We can depend on food exports to Congo than selling maize to Malawi. Let’s sell finished products. And the government sold to Malawi meaning even a local farmers can sell to Malawi or its only the government. Your PF despise Zambian businessmen and call them smugglers, when all they want is to do international trade with the Congolese, what’s so illegal about selling maize and mealie meal? When levy mwanawasa saw this demand from Congo he came up with the winter maize, unfortunately his successors have abandoned a brilliant idea, that could have seen Zambia produce and export milisi all year round. You have seven countries around you, big market. Citizens become innovative entrepreneur wise and you call them smugglers. How uncouth! Imagine calling your own businessmen smugglers even jailing them. Every thing Dangote said is true and any government worth its salt should follow his advice through, however, I have a bone to chew with Aliko Dangote; Look Deep Into Yourself, You’re the Richest African but how are you amassing so much wealth? You’re in collusion with corrupt government officials to shamelessly exploit the very people who have made you what you are: Your Employees at your many companies. Give your employees a living wage twapapata! Businessmen will always work with the government of the day, not opposition in any country. How did Jobs, Gates acquire their wealth? Give credit where its due and the wealth didn’t just appear. In respect to the living wage, unless your Minister of Labour actually works with your parliament to pass law to that effect, Zambians will always get low pay. Even the miners who went on strike in Luanshya are on K2,300. Who do we blame for that? My Father why is it that always it’s people from outside. What did Kaunda do to Zambia. Very rich land but many poor people. Mr President empower your people. Give farmers tractors on nkongole even Dongote alakongola. He got inkongole for a fertilizer plant, which I think plans to do also in Zambia. Ask FQM, Zambezi Portland and the West, they will tell you that Nkongole works for it empowers. Create a system….Mr president. Borrowing in Zambia is available, however the rate is high. Furthermore if you look at the people in Zambia who have accounts, mobile wallets etc The financial inclusion is limited so banks cannot lend with no history. Its also not about the lending, but teaching people what to do with the money. Aside the banks you have organisations such as CEEC who lend. The youth empowerment fund was also available but because they are not taught how to manage businesses, the money is spent. Intelligent people see opportunities where others see obstacles. Surely, maize can push this country to cloud 9. Seven neighbours looking up to us for stable?and you call that smuggling instead of international trade ? negative mind. Everything in Zambia is government to blame..! Dangote is an individual like u and me…! Lets stop this government dependency syndrome and take up business opportunities to grow our economy..! Mr Munene, exactly what we are saying here. People don’t want to depend on government, hence they have found a very good opportunity, highly rewarding, niche market to export maize to neighbouring countries , and they are unfortunately being called smugglers. That picture speaks volumes…what a weak and corrupt leader we have in State House. Dangota flies his jet on Saturday, weekend and he is able to have a meeting with Mutati at his office and at State House with this smiling foool we call President who does nothing. This is why that Indian KCM Chairman was bragging about his visit to State House to see the President and buying the mine for a song. Dongote knows that he is dealing with an empty tin here where he has to draw things out with crayons as he knows that these tins only think loans!! Just a reminder Felix Mutati has shares/connections to Dangote. He enabled Dangote investments by express process in Zambia using his office in return for shares during MMD government. Mutati was Commerce minister then. Mutati is still MMD president though is minister of Finance in the conundrum of Lungu (PF), RB (MMD) and Mutati (till July/August 2016 RB sponsored MMD convention hurriedly to usher Mutati as MMD president on instructions from Lungu and RB to support PF in the August 2016 elections – his reward Finance minister. The problem I see can’t blame Dangote, the government .as Zambians let’s learn how to think and do greater thinks in life.give a Zambian a loan ,borrowed money .all he or she will think first is drinking beer ,buy a car, flat TVs in all bedrooms.forgetting that borrowed money. How do you invest when all u work for goes to beer. Think as Zambians .don’t blame those that has gone ahead learn from them. What happened to the winter maize programme left by mwanawasa. Learn something . The idea of exporting maize is excellent we need to just improve productivity in next season for local and export market. Individuals should have interest in agriculture not just depend on GRZ to do it for u. We need a paradigm shift.